There were 693 press releases posted in the last 24 hours and 153,591 in the last 365 days. CHICAGO, IL, UNITED STATES, November 5, 2018 /EINPresswire.com/ -- Corporate, civic, and education leaders attended the inaugural Distinctive Schools gala, held November 1 at Savage Smyth in Chicago, Illinois. The dollars raised will go to scaling personalized learning at all Distinctive Schools’ campuses, as well as curriculum and classroom needs for teachers. The positive impact of Distinctive Schools and the future of its work was on display throughout the evening. School teams and Distinctive Schools network leaders shared campus spotlights and flexible learning furniture, from 3 Oaks Resource Group International, was exhibited around the room. 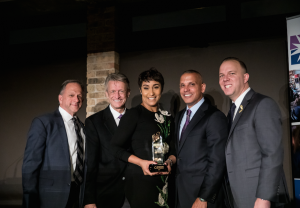 Additionally, during the gala, Ron Huberman, Distinctive Citizen Committee Chair, presented the inaugural Distinctive Citizen Award to the first honoree, Desirée Rogers. Rogers serves on the cabinet of the Conquer Cancer Foundation. She is also the Chair of Choose Chicago, the tourism bureau of the City of Chicago and on the boards of World Business Chicago, Donors Choose, and Northwestern Memorial Hospital. During Rogers’ remarks, she shared her family’s legacy as teachers and community leaders, as well as emphasized the importance of education and giving back. “We cannot forget that the best way to ensure a great future of our schools, students, and communities is to invest in the education of today’s children,” added Huberman. The Chicago Children’s Choir, which featured students from CICS Irving Park, also delighted the room with a musical performance, and CICS Prairie’s school director, Jennifer Harth, and staff shared with the audience what Distinctive Schools means to them. Gala attendees gained a deeper understanding and appreciation of both the depth and breadth of the the work seen at Distinctive Schools and got to experience what really sets the school network apart: Kindness, optimism, growth, collaboration, and commitment to relationships, innovation and high quality rigorous personalized learning.